Liverpool-born pianist/vibist Kevin Lovelady received piano lessons as a child but did not begin to take the piano seriously until his early twenties. A career in IT and languages (he speaks 3 languages), he is mainly self-taught as a jazz musician apart from a few basics from Rob Gibney in the mid 1980s. At this time, having bought one of the early Roland digital pianos (HP700), he pulled together his first band and made his first public performances with the Dave Edge Quintet, taking the name from one of the members of the band, a rising tenor sax star on the Liverpool scene, Dave Edge. 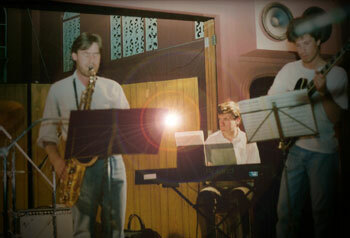 The band also included Pete Wilkinson who went on to join the multi-platinum selling band, Cast. Leaving Liverpool in 1988 for a work assignment in Paris, he had the opportunity to study with the Caribbean jazz pianist and teacher Michel Sardaby. During this inspirational time in Paris, Kevin composed most of his compositions at the same time as getting to grips with the then emerging Midi technology.